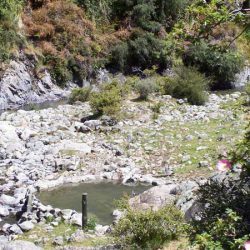 The pools downstream were better, one hot, one perfect one cold. We spent the day there, good 4×4 track, need low range and diff lock for a few spots. Get access to the combination lock for the gate through the DOC website. Register your car for the st james conservation park and they give you the combination, it changes every 2 weeks. 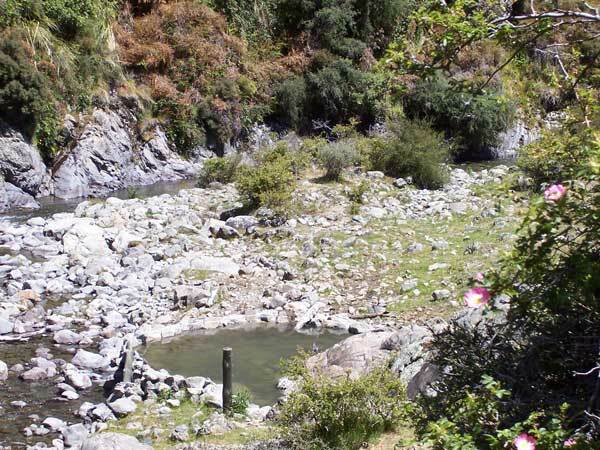 The pools have been well made with concrete and rocks, however there are a few leaks if a volunteer wants to fix them. There are a few sandflies around, same as everywhere. 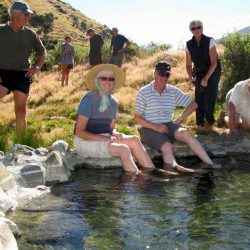 From Hanmer, drive over Jacks Pass, turn left to St James Homestead, walk down Peters Valley and over Peters Pass to the Edwards River. 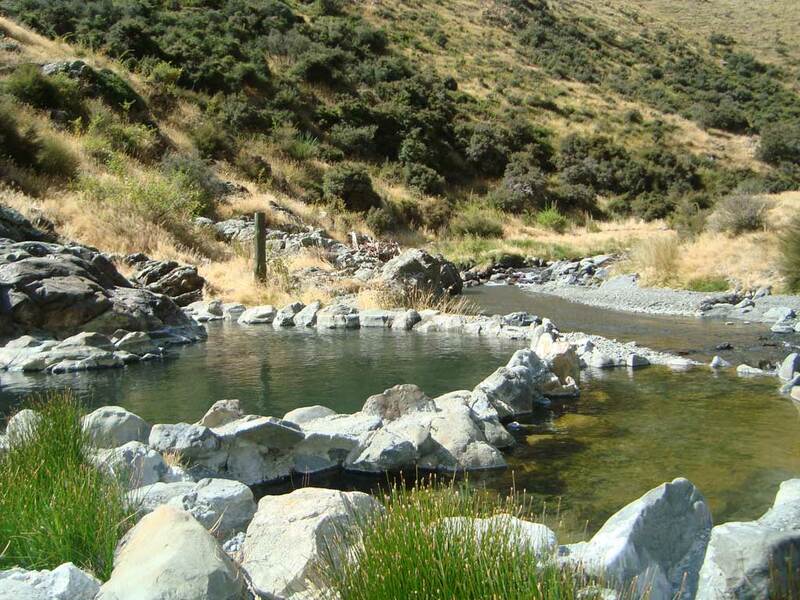 Cow Stream is on the left, the hot pool is located at the foot of the hill. 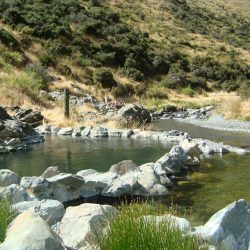 Map showing location of Cow Stream Hot Spring, Hanmer Springs . Use the controls on the map to zoom in and out. Absolutely Fantastic! We biked in from St James Homestead, made a perfect day trip. 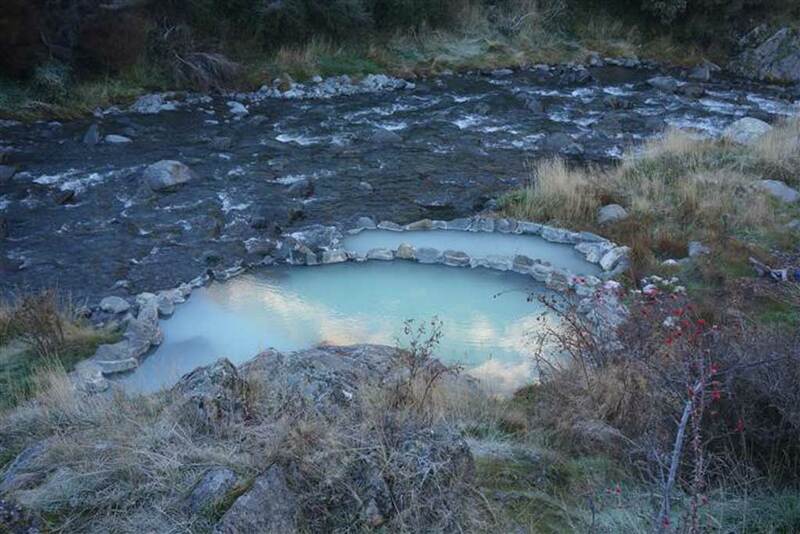 Hot pools were super warm and in an awesome remote location. Would recommend to anybody and everybody. 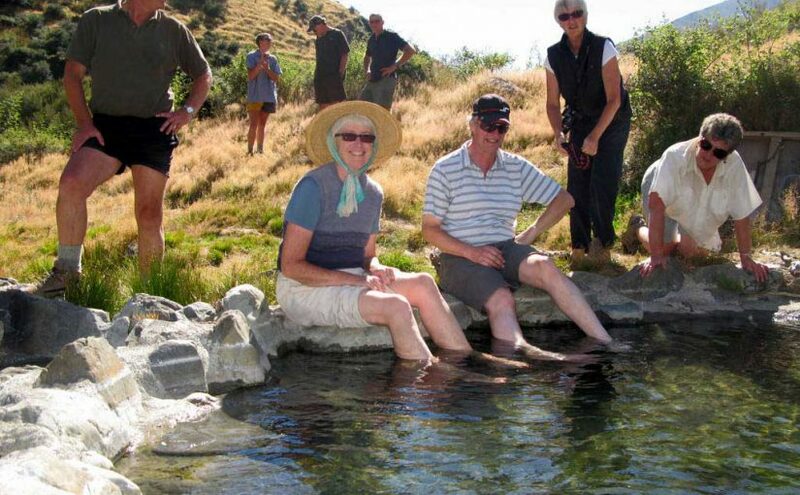 The pools downstream were better, one hot, one perfect one cold. We spent the day there, good 4x4 track, need low range and diff lock for a few spots. Get access to the combination lock for the gate through the DOC website. Register your car for the st james conservation park and they give you the combination, it changes every 2 weeks. 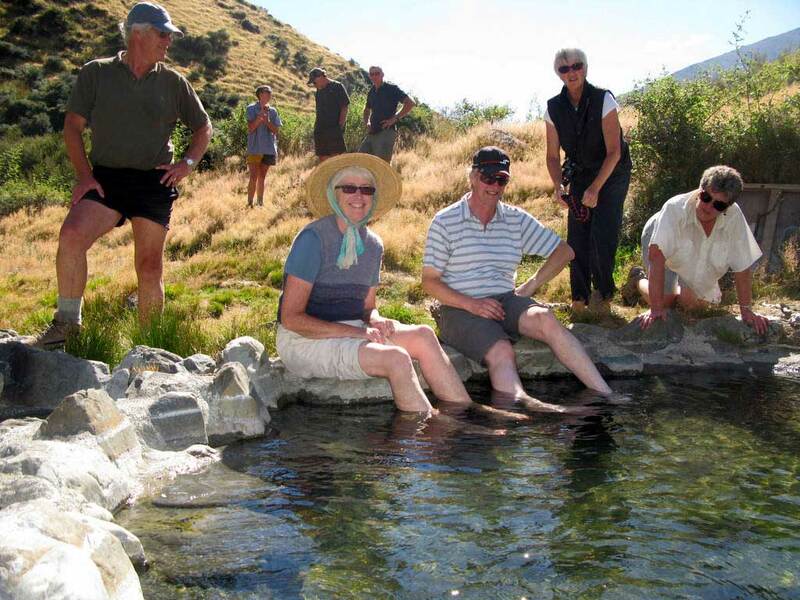 The pools have been well made with concrete and rocks, however there are a few leaks if a volunteer wants to fix them. There are a few sandflies around, same as everywhere. Lot of faeces and rubbish there, Dead pig intestines thrown in the pool, Wouldnt risk my health to return there. Cows still in the valley, darn it. 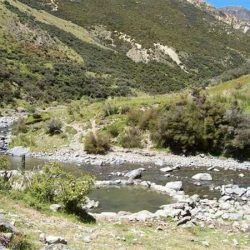 We saw 3 to 4 in the head of the little stream just west of Charlies Saddle. They took off and hid smartly. Hi Maree! Good to see you getting out and about. Love to Ray. 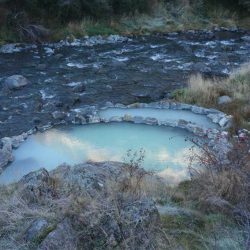 I'll put in a link to show the real location of the hot pool. The image above is very wrong! The grid references in NZMG are E2483155, N5864516. You can convert this to the 2000 format on the linz site. I'm off to Google Earth to try and put the correct location on their site. Ditto your review Honora. Visited it on Monday 24th. Almost too hot to sit in. Sandflies were active though. Walked from the main 4WD track. Tandem paraglider sailed in thermals over the main river while we were in the pool. 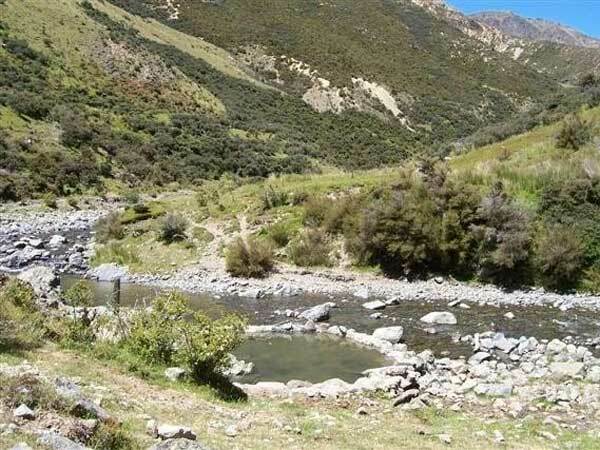 Later in evening while we were camping by the hut they walked up after landing at the Waiau. They were tourist paragliders and had taken off from St. Arnaud earlier in the day. Were travelling light and continued to walk out. We saw a few steer down by the Waiau over Charlie's Pass. Hope they stay down there and don't visit the pool again. any chance of some topo co-ords ?Can you now 4WD to the pool? Ha! Checked it out today and it is excellent. It fits about 6 people as there are hot spots but if you bring a closed cell foam pad, you'll be sweet and will get more people in there. It was chest deep when sitting. Yes, the side has collapsed a bit, I guess due to a flood but some kind people have built up the wall with some of the mud and rocks. It would be good to do a good concreting job again. The level used to be about a metre deep when the wall was built. Today, there were hardly any sandflies there! The place has been destocked so cow manure will be a thing of the past. A mate says it is only ankle deep and fits 2 people. I'll have to check it out and report back!